Our Paris Cat & Dog Aprons in Japan! Merry Christmas - Specials on our Shipping Costs for our gorgeous Retro Vintage Australian Designed Homewares. Sierra Rose Designer Homewares is proud to announce that we are in Kids on the Gold Coast Magazine, Kids in the City - Brisbane and Kids on the Sunshine Coast. We are featured in the Christmas Gift Ideas section. 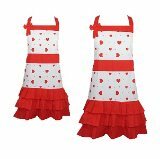 Matching mummy and me Aprons are perfect for spending quality time with your little loved one. They will adore spending time with you while you bake or cook together. With 10 prints to pick from, you will find one to suit that special person or dear friend in your life. Our collections are designed to be purchased altogether or added to in the future, as some designs have up to 7 products in the one range. Summer is nearly here, and we have created that special new collection for the season. Our Summer rose collection features an apron, tea towel and matching oven mitt. With an abundance of pretty roses and lively pinks this is a truly pretty collection. Be chic and girly this summer. Fun loving summer days are ahead for barbeques or to hostess a party. With seven wonderful designs to pick from, your little one will enjoy wearing a matching apron with you and spending that special quality time that comes while you bake or cook together.